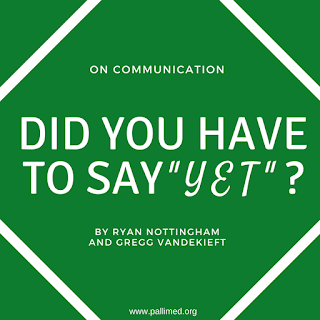 Did You Have To Say “Yet”? A middle-aged man* came to our ambulatory palliative care clinic with his family. With the exception of his recently diagnosed brain tumor, he was in peak physical condition. His diagnosis weighed heavily on his family and his personality changes and angry outbursts left them frayed. He did not feel the same burden as his family since these outbursts came to him in the form of blackouts. We could visualize him as a man of few words before his diagnosis, someone who would speak up with a dry one-liner. During this visit, his humor was touched with acidity. As we began our conversation, his pent up frustration slowly infused into the room. His wife was able to put her concerns on the table while his children held his hands. He visually softened and received their words without response. After the catharsis, when all questions had been asked and tears had been shed, the family looked exhausted but ready to move forward. Before the visit concluded, the physician completed a brief physical assessment. As he worked his way through the neurological exam, he noted positively to the patient, “no loss of strength yet”. As much as we use our words to care for our patients, they also have the potential to cause harm. Many medication side effects are frustratingly vague and similar to potential disease symptoms; fatigue, headache, moodiness, and nausea, for example. While counseling patients to be aware of these effects, we can inadvertently trigger them to be hyperaware of their body processes. This information can subsequently lead to new or exacerbated symptoms that might not have been an issue otherwise. Allocating the appropriate amount of emphasis on various counseling points can ensure the patient is both well informed and at reduced risk of false-positive side effects. For our patient, the amnestic qualities of his outbursts and his physical strength buffered him from his diagnosis. Even after our discussion, after his family had pulled out all the skeletons, he remained behind in the closet. In the article What It’s Like to Learn You’re Going to Die, the term “existential slap” denotes the moment when a dying person viscerally comprehends their upcoming demise. For some it comes at the time of diagnosis, others as their body begins to reflect symptoms of disease. For our gentleman, it would be several visits before his full realization of his clinical situation. So hearing the implicit message of his impending decline – of which he was cognitively aware but not yet emotionally prepared - was unwelcome. The tenor of the entire encounter was adversely affected by one unconsciously uttered word. The balance between honesty and tact varies depending on the person, where they are in their illness trajectory, and the extent to which they have “processed” both the past and future course of their illness. Striking the right balance requires insight into the patient’s understanding of their illness and how they would like information to be presented. Palliative care opens conversations in which many people do not wish or expect to find themselves. Skillfully and sensitively dispensing the correct blend of hope and facts takes training, and occasionally trial and error. Sometimes, the only way to find out is to have a misstep – perhaps a misstep of a single word. Just remember: Slips happen. Some will be embarrassing; others inimical; some would even make Freud smile. These situations happen to everyone, in every discipline, at every experience level. So whether it is a misstep, misspeak, or mistake, remember to get back up and keep going. Your future patients will be grateful of how the experience helped you grow. *Identifying details changed to protect patient privacy - Ed. 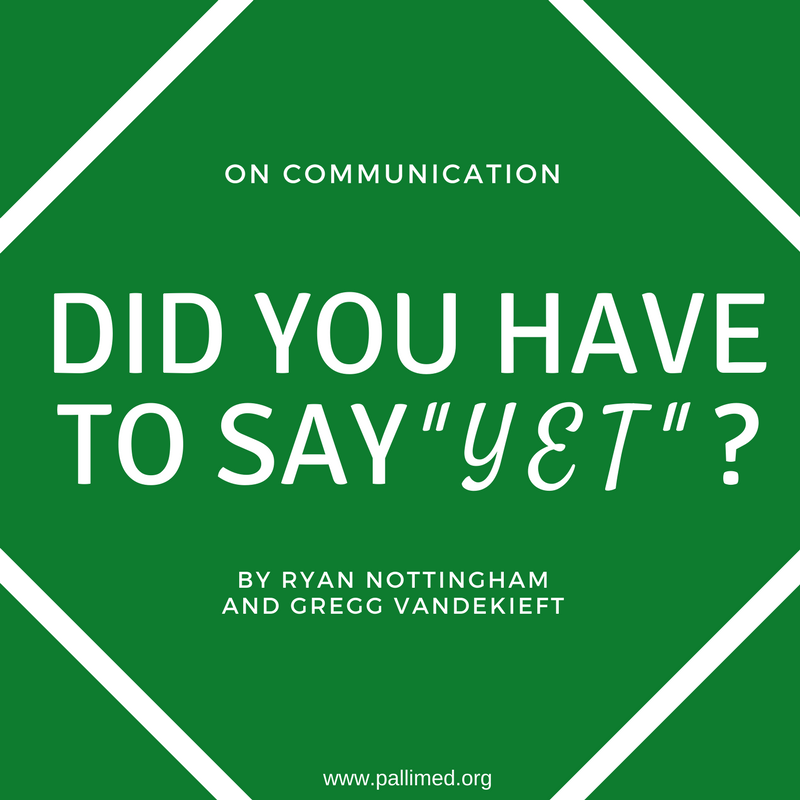 For more posts on communication, click here. 2. Dear J. What It’s Like to Know You’re Going to Die. The Atlantic. Published online November 2, 2017.